A very well written teen age drama with poor portrayal by the main actress. Indeed, I think Katherine Langford cannot play well a tortured teen ager and was a poor choice for the role which is a shame, because the entire story revolves around her. 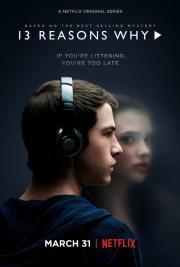 Even with this, the show is a solid teen age drama and it's worth watching if you are interested in the genre. İlk sezonu mükemmel, ikinci sezonu ise idare eder. Her bölümde ayrı bir olay var. Tecrübesiz bir cast kadrosuyla çok iyi bir ün yakaladılar. It is such a problematic show, and I hate it. I'm sure it has its good qualities but I can't see them past how much they make suicide seem to be this great revenge. It's not all that accurate and I'm left watching a show that makes suicide not seem like it isn't the worst option ever. As a pure drama, the first season is pretty good. I can swallow a lot of bad choices due to calling this a drama and not harping on what it 'romanticizes' and what it doesn't. Who cares? It's just telling a story. But the first episode of the second season completely turned me off to this show and I'm out. The very last scene is the most ridiculous thing I've seen in awhile, and of course Gregg Araki was involved.